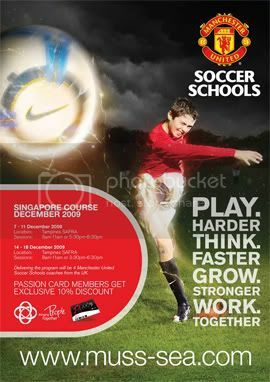 Manchester United Soccer Schools (MUSS) will be conducting a youth soccer coaching course in Singapore from 9-13th December 2008. Boys and girls between the ages of 8 and 16 will be offered the opportunity to make the most of their ability through a specially tailored course. The emphasis will be as much on personal development of the children as it is on soccer skills. Creating confidence both on and off the pitch is a key element of all MUSS programs, but most of all it is about having fun through football. Manchester United Soccer Schools will use the latest training equipment and coaching techniques at Tampines SAFRA to help young players improve their skills in a fun and friendly environment. Every player on the 5-day course will have the chance to take part in a number of unique skills tests which are designed using the Club’s coaches and players and specifically tailored so that all participants, regardless of age, can compete on level terms. Two lucky winners will be chosen to represent Singapore at the 2009 MUSS UK Residential course alongside players from over 70 different countries. A team of highly qualified MUSS coaches will travel from the UK to host the course and will be assisted by carefully selected local coaches to help support the development of the game in the region. Manchester United Soccer Schools’ operation in Singapore joins international operations in Dubai, South Africa, Australia and Europe. This is an incredible opportunity for children of all ages and abilities to learn to play with the style and traditions of one of the worlds’ greatest soccer clubs. For more information or to book a place on the first Manchester United Soccer Schools course in Singapore, please visit http://www.muss.sg. must send my nephew there! was reading the newspaper (TNP) and came across an article which some of you might be interested in. ahhhhhhhhhhh i'm like a year too old!! Has soccer always been your PAssionate sport? 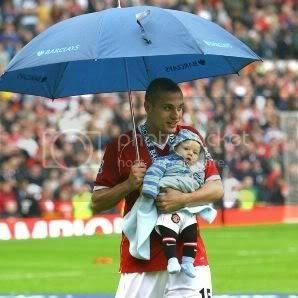 An ardent Manchester United Fan as well? The PAssion Card Team is happy to bring to you an EXCLUSIVE 10% discount off the Manchester United Soccer Schools Course fees just for you! If you are aged between 7-18 years old, here’s your chance to be trained under a team of 4 Manchester-United Soccer Schools (UK) Coaches. In conjunction with this promotion, the PAssionCard.tv team is also running an exclusive contest. Visit http://www.PAssionCard.tv for details. Current time: 04-20-2019, 02:38 AM Powered By MyBB, © 2002-2019 MyBB Group.